Abstract: Sapphirine is a specific high-temperature mineral in Mg-Al-rich granulites, and it is of significance in investigating ultrahigh-temperature (UHT) metamorphism. This study has tracked 47 sapphirine-bearing granulite localities among the worldwide 66 UHT granulite localities, and summarized the textural settings and metamorphic reaction sequences of several most commonly-observed sapphirine-bearing mineral assemblages, as well as the typical features of sapphirine mineral chemistry. Sapphirine compositions are usually localized close to the 7:9:3 end-member, and their XMg is usually higher than 0.7, and XFe3+ shows a large range of 0~0.7. Formation and evolution of the sapphirine-bearing mineral assemblages in the rocks indicate the experienced P-T paths. Textures of sapphirine replacing spinel, Grt/Opx+Sil replacing Spr+Qz assemblage, and subsequent Spr+Crd±Opx symplectite replacing Grt/Opx+Sil assemblage, generally indicate the cooling and subsequent decompression parts of an anticlockwise P-T path. 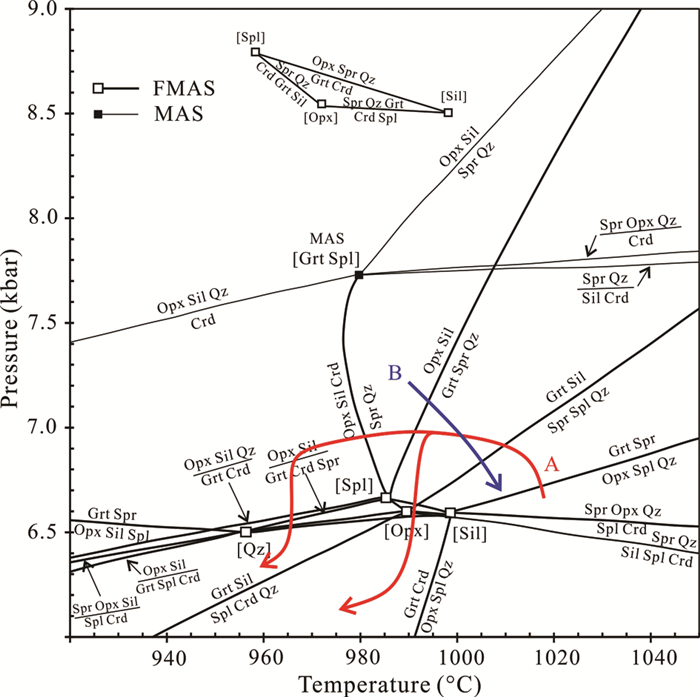 Whereas, the texture of Grt/Opx+Sil/Ky or Mg-rich staurolite producing Spr+Qz assemblage, suggests that the rocks have probably experienced the heating and decompression stages in a clockwise P-T path. Different shapes of P-T paths imply that the origin mechanism of the UHT metamorphism is multiple, with the former probably resulting from underplating or accretion of the mantle-derived mafic magma, and the latter probably related to the long-lived hot orogenesis. 结构位置 Early Early Late Sympl. sympl. on Opx-Sil Spr2a porph. Blereau E, Johnson TE, Clark C, Taylor RJM, Kinny PD and Hand M. 2017. Reappraising the P-T evolution of the Rogaland-Vest Agder Sector, southwestern Norway. Geoscience Frontiers, 8(1): 1-14. Bose S, Fukuoka M, Sengupta P and Dasgupta S. 2000. Evolution of high-Mg-Al granulites from Sunkarametta, Eastern Ghats, India:Evidence for a lower crustal heating-cooling trajectory. Journal of Metamorphic Geology, 18(3): 223-240. Chang LH, Chen MY, Jin W, Li SC and Yu JJ. 2006. Handbook for Identification of Transparent Minerals under Microscope. Beijing: Geological Publishing House: 198-199. Giovanardi T, Morishita T, Zanetti A, Mazzucchelli M and Vannucci R. 2013. Igneous sapphirine as a product of melt-peridotite interactions in the Finero phlogopite-peridotite massif, Western Italian Alps. European Journal of Mineralogy, 25(1): 17-31. Grew ES. 1980. Sapphirine+quartz association from Archean rocks in Enderby Land, Antarctica. American Mineralogist, 65(9-10): 821-836. Grew ES. 1982. Osumilite in the sapphirine-quartz terrane of Enderby Land, Antarctica:Implications for osumilite petrogenesis in the granulite facies. American Mineralogist, 67(7-8): 762-787. Guo JH, Peng P, Chen Y, Jiao SJ and Windley BF. 2012. UHT sapphirine granulite metamorphism at 193~1.92Ga caused by gabbronorite intrusions:Implications for tectonic evolution of the northern margin of the North China Craton.. Precambrian Research: 124-223. Leong KM and Moore JM. 1972. Sapphirine-bearing rocks from Wilson Lake, Labrador. The Canadian Mineralogist, 11(4): 777-790. Liu JZ, Qiang XK, Liu XS and Ouyang ZY. 2000. 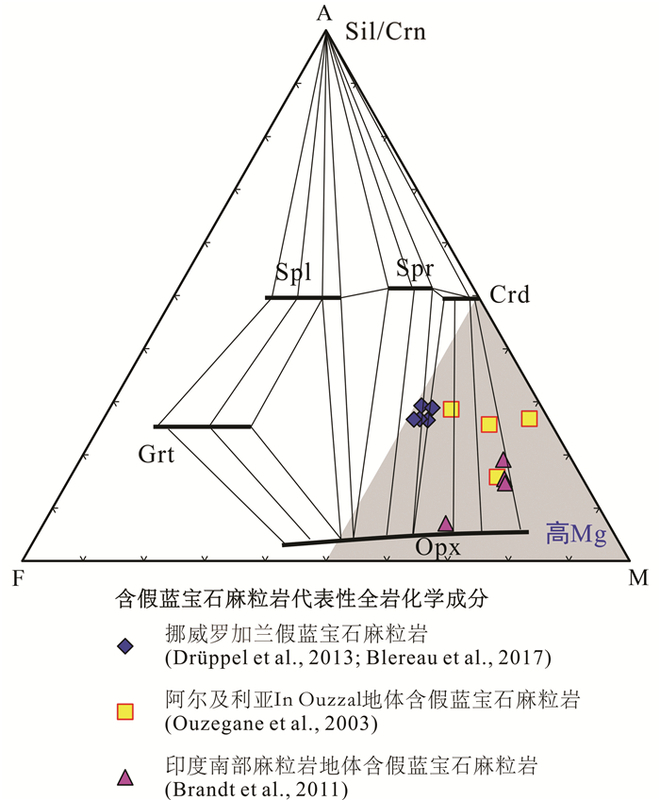 Dynamics and genetic grids of sapphirine-bearing spinel gneiss in Daqing Mountain orogen zone, Inner Mongolia. Acta Petrologica Sinica, 16(2): 245-255. Mohan A, Tripathi P and Motoyoshi Y. 1997. Reaction history of sapphirine granulites and a decompressional P-T path in a granulite complex from the Eastern Ghats. Proceedings of the Indian Academy of Sciences-Earth and Planetary Sciences, 106(3): 115-129. Motoyoshi Y and Hensen BJ. 1. Sapphirine-quartz-orthopyroxene symplectites after cordierite in the Archaean Napier Complex, Antarctica:Evidence for a counterclockwise P-T path?. European Journal of Mineralogy, 3: 467-472. Nishimiya Y, Tsunogae T and Santosh M. 2010. Sapphirine+quartz corona around magnesian (XMg~0.58) staurolite from the Palghat-Cauvery Suture Zone, southern India:Evidence for high-pressure and ultrahigh-temperature metamorphism within the Gondwana suture. Lithos, 114(3-4): 490-502. Romer RL and Rötzler J. 2001. P-T-t evolution of ultrahigh-temperature granulites from the Saxon Granulite Massif, Germany. Part Ⅱ:Geochronology. Journal of Petrology, 42(11): 2015-2032. Rötzler J and Romer RL. 2001. P-T-t evolution of ultrahigh-temperature granulites from the Saxon Granulite Massif, Germany. Part Ⅰ:Petrology. Journal of Petrology, 42(11): 1995-2013. Xiang H, Zhong ZQ, Li Y, Qi M, Zhou HW, Zhang L, Zhang ZM and Santosh M. 2014. Sapphirine-bearing granulites from the Tongbai orogen, China:Petrology, phase equilibria, zircon U-Pb geochronology and implications for Paleozoic ultrahigh temperature metamorphism. Lithos, 208-209: 446-461. Xiao Y, Zhang HF, Liang Z, Su BX, Zhu B and Sakyi PA. 2018. Origin of sapphirine-and garnet-bearing clinopyroxenite xenoliths entrained in the Jiande basalts, SE China. Lithos, 304-307: 95-108. 常丽华, 陈曼云, 金巍, 李世超, 于介江. 2006. 透明矿物薄片鉴定手册. 北京: 地质出版社: 198-199. 刘建忠, 强小科, 刘喜山, 欧阳自远. 2000. 内蒙古大青山造山带含假蓝宝石尖晶石片麻岩的成因网格及动力学. 岩石学报, 16(2): 245-255.